Using the links on the left: You can click any of the links along the left side to see your Inbox, sent items, archived items, or your trash. 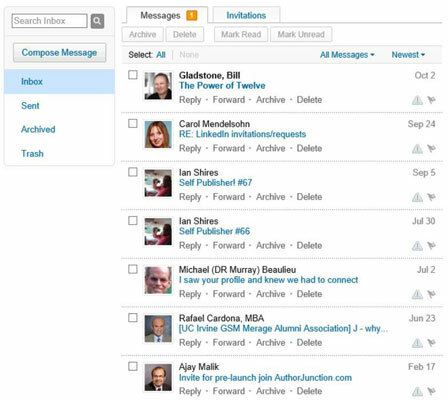 Using the filters: By default, when you’re looking at your Inbox, you see all messages. If you click the drop-down arrow next to the All Messages heading (above your first item), you can pick a specific category (such as InMail, Introductions, Jobs, Unread Messages, Forwarded Profiles, or Recommendations). Archiving: After you read your message, you can archive the message for later viewing. However, unlike other e-mail systems, you can’t create your own folders within your LinkedIn Inbox. Instead, you simply archive a message into a general archive. From within the message, or in the list of messages in your Inbox, just click the Archive link to move the item from your Inbox to your Archived folder. To view your archived messages, click the Archived link on the left side of your screen when looking at your Inbox. Your archived messages appear in the same place where your Inbox messages appeared. You can also filter your archived messages the same way you filter your Inbox messages. Deleting: If you don’t want to keep a message, click the Delete link.